Mar 23rd Kindness Challenge – EMPOWER someone else to pay it forward (preferably a child or someone going through a difficult time)! A lot of children have good hearts with kindness ideas that get squashed due to lack of resources whether it be money, time, or adult involvement. Today I attended an assembly where an amazing 4th grader, Landen, had mobilized a new stuffed animal drive at his school. 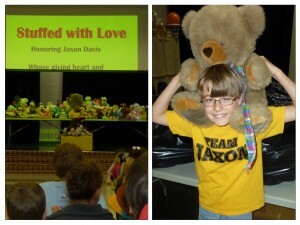 He named the project “Stuffed with Love” and went before the student council twice for approval, coordinated with school staff, and invested a lot of time in marketing and making signs to promote the drive. Landen’s stuffed animal drive was a huge success and around 170 hospice kids will be blessed with an animal to help bring them some joy! We are so proud of Landen’s big heart, and we are extremely grateful for those at the school, community, and Landen’s family that EMPOWERed him to make his idea a reality. Brainstorm with a child something they might want to do to help someone else, and find a way to make at least 1 of those ideas happen! Or think of someone going through a difficult time, and find a way to EMPOWER them to do something to make a difference / pay it forward for someone. Words don’t do justice to how uplifting it is to be giving out to others in the midst of your own challenges. Help EMPOWER someone with the resources (possibly time, money, knowledge, etc) to help them make a difference in someone’s life. For our 23rd challenge we chose to give spirit sticks (embroidered patches) to a 12 year old, so he could sell them to raise money to fund a pair of Peach’s Neet Feet custom painted shoes. The shoes will be for their classmate battling cancer, and we are thrilled for the opportunity to EMPOWER them to be able to sponsor these special shoes.